Anthony and Ronald, the alleged owners of Gold Digger app promise to make you thousands of dollars everyday with their revolutionary Gold Digger binary software app. Don’t be fooled though, as Gold Digger is a scam. Read our detailed Gold Digger App review to find out the truth behind their fake claims. So many lies within the homepage! Gold Digger scam (yes, gold digger is a scam) is giving us a lot of promises within its homepage. You may come across a different landing page, but all of them basically lead you to the same product and financial headache. Sounds like a deal of the lifetime? Not so fast. Forget all the promises of quick riches in their flashy sales video. Clench your credit card tightly and don’t give in to the sales pitches, because you’ll have a financial headache to deal with if you fall into the scam. Let’s look at how Gold Digger scam breaks every single one of their promises. It’s as if Anthony and Ronald have forgotten what they promised just a moment ago. If you look through the steps required to get started with Gold Digger app, you’ll realize that signing up with a broker account is the very first step. As soon as you register for a broker account, you’ll be required to fund the trading account to get started. Even though Gold Digger App and its owners can argue that the money are still yours and you can still withdraw them, be prepared to never see your deposit again (see proof below). As you register for a brand new broker account and fund it, you will need to fill up your personal details. You are required to fill up your email address. Not only that, Gold Digger Scam is also requesting for your phone number before you can complete the registration. The process cannot be completed without all these information. Why is Gold Digger scam collecting your details? Apart from setting up a broker account, they also use these details to promote even more scams. I have a dedicated email address and an old phone number used to review scams like this, and I receive scammy emails and unsolicited sales calls on a daily basis. If you value your privacy, DO NOT provide any details to Gold Digger scam. You are NOT guaranteed to make money! This is perhaps the most alarming out of all the promises that Anthony and Ronald have broken. Despite giving you the guarantee to make money within the first 30 minutes, they are going back on their words using the disclaimer. The disclaimer can be found as a fine print at the bottom of their webpage. But how many people actually clicked into it and read it? Not a lot. I’ve underlined the critical clauses in red. 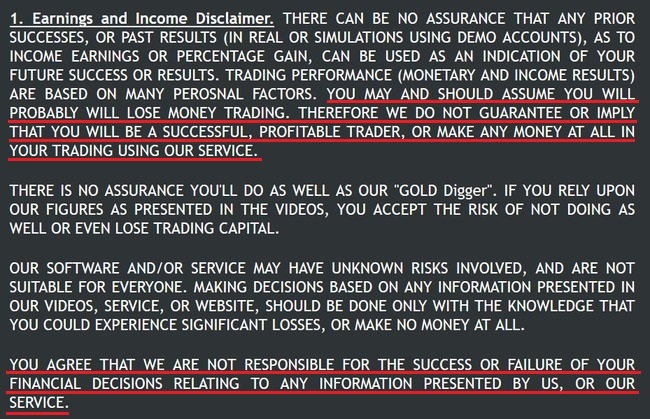 In the disclaimer, it is clearly stated that they do not guarantee you’ll make any profit with Gold Digger scam. Not only that, you will most probably lose money trading with their app! Finally, when you lose money using Gold Digger app, you agree not to hold them responsible. If they wanted to be honest about the risks of using the software, they would’ve told you in the sales materials. Instead, they chose to present you with lies and fake promises. With so many promises broken, you should steer as far as possible away from the scam. 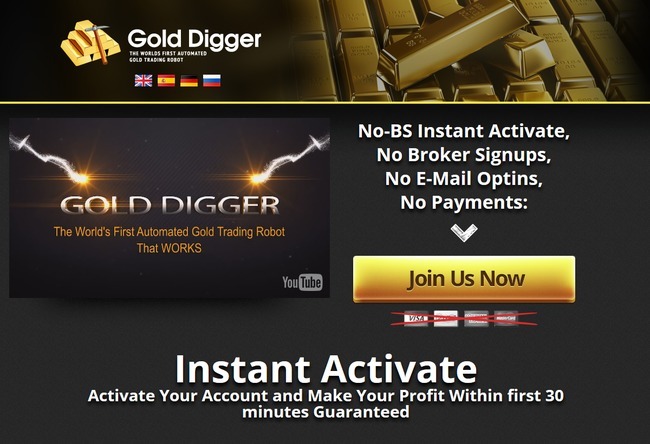 However, if you somehow still think that signing up with Gold Digger scam is a good idea, let me walk you through the process of binary trading to let you understand how it really works. Since this is a binary software scam, it’s essential to talk about how binary trading works to make sure everyone is on the same page. If you have experience trading binary options, you may skip ahead to the next segment. Binary options is basically trading stripped down to its simplest form. Unlike the stock market, there’s nothing much to analyze in binary options. You just have to guess if the price of an asset will rise or fall after a short period of time, usually between 30 seconds to minutes. This is how it works – let’s say I guess that the price of gold will rise after 60 seconds, and I bet $50 on a 1-minute contract. When the time is up, and the price is indeed higher, I win a certain percentage of what I bet, usually between 60% to 80% (between $30 to $40). But if I’m wrong, I lose the entire $50 that I bet. In reality, trading binary options is not that different from gambling. Can you predict the outcome of a coin toss and get it right consistently? Of course not. Naturally, you can only depend on luck or gut feelings. The same principle applies to binary options. Even using a software like Gold Digger app won’t help you. Unlike what binary software scams like to claim, there’s no algorithm that can predict the market movements accurately, because the movement is comprised of the decisions of thousands of real, human traders. You cannot predict human behaviors with an algorithm. Even the auditor is not real! I believe some of you noticed that Gold Digger scam included the report of a notary public and claims that all the trade results have been verified by an independent auditor. This has certainly made it seem more reliable, but have you questioned the identity of this auditor, and if the report is authentic? I did, and this is the findings. Firstly, you’ll notice that the name of the notary public is Hans Peter Schmidt, and he owns a notary company called Notary Schmidt. He even provided a website at the following URL (http://notariatschmidt.de). Try clicking into the URL, and you’ll realize this website is non-existent. This is the first warning sign. Secondly, I researched the true identity of this man. Guess what, he’s not a notary public at all. The real identity of the alleged notary public. The true identity of the man in the picture is Prof. Dr. Lorenz-Peter Schmidt, and he’s an electrical engineering professor in Friedrich-Alexander-Universität Erlangen–Nürnberg (FAU). 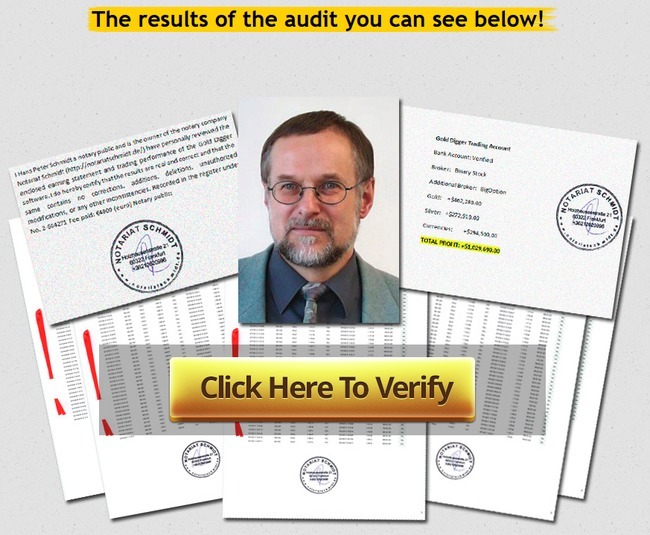 Apparently the scammers behind Gold Digger scam stole this picture and relabeled him as a notary public called Hans Peter Schmidt. 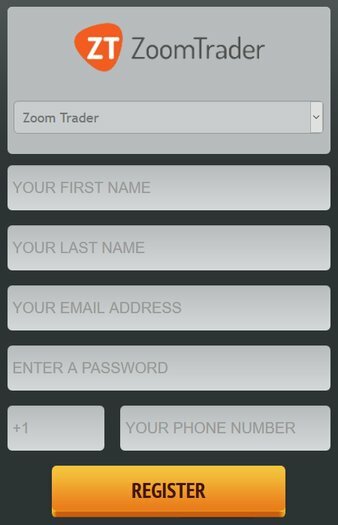 If you decide to sign up for Gold Digger app, you’ll have to open a binary trading account through their sales page (which is an affiliate link). The team behind Gold Digger scam will earn a sum of referral fees as soon as you make your first deposit into the account. I was assigned to ZoomTrader, and the minimum deposit is at $250. You may be assigned to different brokers depending on your country and location, but the minimum deposit for most brokers is $250. You have to register for a brand new broker account even if you already have an existing account with their designated broker, because the scammers behind Gold Digger scam cannot earn their referral fees if you don’t sign up through their affiliate link. YES, GOLD DIGGER IS A SCAM. As we’ve said in the review earlier, we don’t recommend binary options trading as a way to make money online, at all. It’s basically the same as gambling, and using an automated trading software doesn’t make a difference. You are essentially putting your hopes and entire investment in a piece of software that gambles on your behalf.